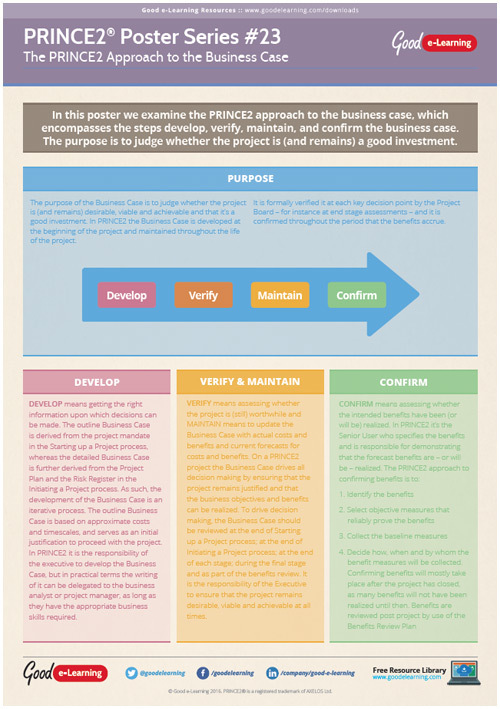 In the latest of PRINCE2 poster we’ll take a look at the PRINCE2 approach to the business case. Here we examine the PRINCE2 approach to the business case, which encompasses the steps develop, verify, maintain, and confirm the business case. The purpose is to judge whether the project is (and remains) a good investment. Download your copy of this exclusive PRINCE2 poster to find out how the PRINCE2 approach to the business case and benefit both you and your organization.